Have you been dreaming about starting your own mobile food business? Congratulations! You’ve already got what it takes to succeed in mobile food vending. Mobile food and concession businesses are fueled by passionate individuals who believe in what they do and love making people happy. The most successful mobile food businesses combine delicious food with fast and friendly service. It’s not hard to start a mobile food vending business. Having a plan and knowing what to expect makes the process even easier. The following information is provided to help guide you toward setting up your mobile food business and getting the proper licensing. 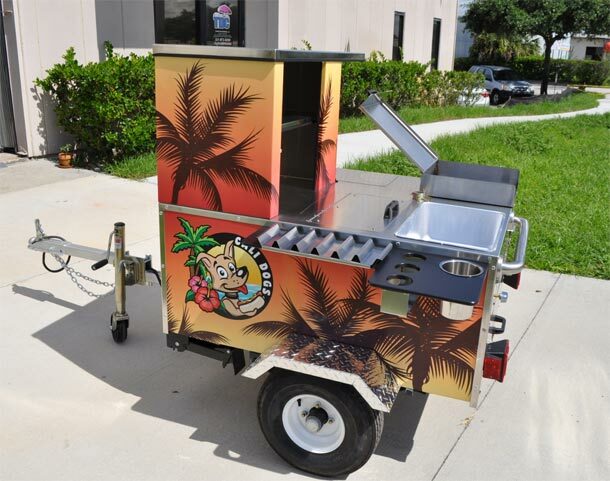 Are you planning to open a mobile food business in Florida? We have collected information just for you. Before you can open a mobile food business you need to choose a location (or locations). More importantly, you need a GOOD location. Good locations are cost effective, have a high volume of traffic and offer good exposure. You can tow your Top Dog Cart almost anywhere but you’ll probably find the best locations are near office buildings or schools, farmer’s markets, festivals, busy intersections, and parks (to name a few). Begin by choosing several possible locations for your mobile food business. Then find out if they are on public or private property (you can call the local Chamber of Commerce for this information). Locations on public property may require you to carry additional permits. Locations on private property may require a rental agreement with the land owner. In some cities, mobile food vendors are only allowed to operate in certain areas or during certain hours. This is information you will want to know before you purchase your mobile food cart. Once you’ve found a location, consider what hours you will be open. If possible, you want to operate your business during your location’s peak traffic hours (lunch or dinner time, after concerts, etc…). Being open during peak traffic hours will make a big difference in your profit margin. The cost to operate at your chosen location and the hours you will be open should be determined, then factored into your monthly operational expenses along with your food and service costs. There are big differences between operating a mobile food vending cart and a concession cart business. Mobile food vending carts can be towed to different locations. Concession carts are usually stationary, requiring a large truck or trailer to transport. Concession carts are usually located within venues such as arenas and sports complexes, convention centers, shopping centers and airports. Mobile food carts are mostly seen outside venues on the street or in parking lots. Concession businesses operate under the rules and management of their venue. Concession cart owners must work closely with their venue to ensure their carts meet all the criteria necessary to operate at the location. Concession carts must also meet health department regulations. Top Dog Carts meet international health regulations. However, equipment requirements for mobile food businesses vary by state, county and country. Before purchasing a mobile food or concession cart, you will need to familiarize yourself with health department regulations in your area. They will provide you with information about equipment or features required on your cart, such the number of sinks. It’s important you find out all equipment requirements and restrictions needed to pass health inspection before your cart is built. 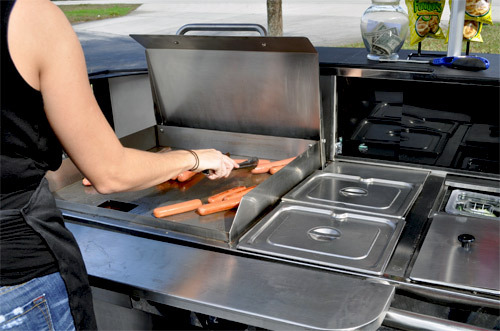 A health inspector may ask for a schematic or plan of your mobile food cart. This is so they can verify that it will meet all requirements. 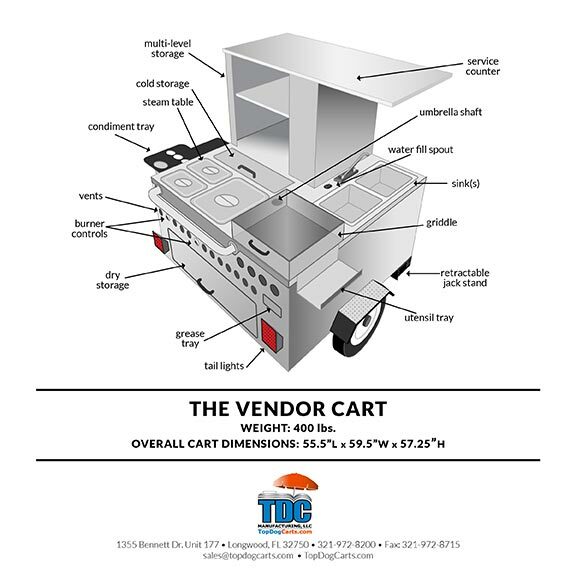 Top Dog carts provides a free schematic of your cart that you can give to the health inspector. A health inspector may also require forms to be completed about your cart before you can pass inspection. If you have purchased a Top Dog Cart, we can assist you with completing these forms. You are required to register your mobile food vending cart in the state you will be operating your business. Some states also require you to carry liability insurance. Check with the DMV about the requirements in your area. All Top Dog Carts come with a Manufacturer’s Statement of Ownership and VIN# that you will use to register your cart. A commissary is a licensed and inspected kitchen where you can store food and supplies and clean your equipment. There will be several in your area. Examples are: restaurants, churches, schools, community centers and banquet facilities. Check with your local health department for a complete list of commissaries in your area. Also known as a Tax Identification Number, this number is assigned by the IRS to identify businesses operating in the United States. More information can be found at irs.gov/Businesses. You will need to obtain this number before you can open any business. Top Dog Carts recommends you purchase liability insurance for your mobile food business. Check with your car insurance company or a local insurance agent to discuss options available to you. You may also contact a food service liability company, such as FLIP for more information. Once you have passed health inspection, registered and licensed your mobile food cart, you’re ready to open for business! For information about marketing your mobile food business, view our section on marketing.